The weather in East Yorkshire hasn’t been so bad – no hurricanes or floods or horrendous weather conditions like that – but it has been very wet, slightly frosty with little bits of sunshine. Yesterday (the day of the Tour de Yorkshire beginning), our weather decided to give us almost all the choices possible: mist, hail, rain, sunshine (just for a few minutes at a time), rain with snowflakes and monsoon rain. In this sort of weather, we have to be very brave to venture up the muddy path to the Kitchen Garden. Erik had been fighting off a really bad cold, I was tidying up, fed up with the weather and dying to get outside to the Kitchen Garden, but I succumbed, just accepted it, and at 2.00pm we lit the log burner, so that’s how bad it was! But it’s another early start for me, now 6.26am, and a smidging of sun is appearing on the houses opposite my little office. I love the fact that we live near the East Coast, and the sun (if it appears at all) lifts itself up above the North Sea early in the morning and can give us an incredible light show of a sky streaked with all colours of the rainbow. Fingers crossed today may be a day when I can put my old gardening clothes on, trousers tucked into my wellies, and venture up to our Kitchen Garden. Even without a greenhouse, I have been growing some seeds in our new room (soon to be a kitchen). And because of the warmth, they have come on amazingly. In fact, almost too quickly. So this is what I have sown. I have been growing this particular Courgette ‘Romanesco’ since I began my Kitchen Garden in 2008, at my previous house in Hessle. It grows into a big plant, the taste is great and the grandchildren love its ridged shape when sliced – the slices, because of Romanesco’s ridges, look like little cogs. Sliced in half, drizzled with olive oil and seasoning plus a scattering of fresh oregano and put under a grill or on the barbie, it is absolutely delicious. I’ve never had any trouble with it at all, and it has fantastic flowers to stuff with ricotta and herbs, or some fresh crab. Ummm …… mouth-watering! I am also having a go at Courgette ‘Soleil, which turns out a vivid bright yellow. 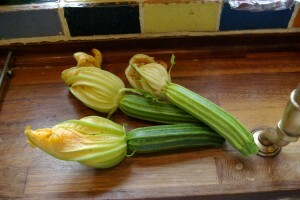 The skin of ‘Soleil’ is thicker than most Courgettes, so Sarah Raven recommends eating these when quite small. I have used Sarah Ravens books, website, seeds and plants for quite a few years now, and her catalogues and website give so much advice. She doesn’t have quite the amount of Vegetable seeds she used to have, but her varieties are very good. Her flower catalogue is amazing, and well worth viewing. The fun Courgette to grow is ‘Tromboncino’, the pale, long Courgette with a bulbous end, on the left of the picture above (some bounty from our Kitchen Garden a few years ago). I grew this last year again, in Hornsea, and it climbed up and swirled around a wooden stand, then the whole plant grew so big it swirled around the tall structure, back down again and around the whole raised bed. The Courgettes just kept on growing, but you don’t want them to grow too huge as they become a funny shaped marrow. My oldest grandson laughed when he first saw them, and said they reminded him of ‘men’s bits’! Bless him! I both enjoy growing and eating the types of Swiss Chard called ‘Bright Lights’ and ‘White Silver’. 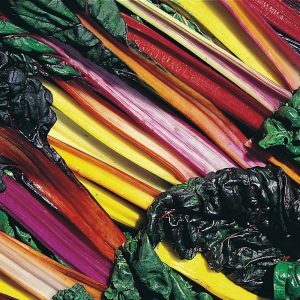 Chard is very similar to Kale, and as well as being a very attractive plant, it is full of healthy vitamins and minerals. ‘Bright Lights’ has multicoloured stems and strong, dark green leaves with coloured veins – orange, bright red, shocking bright pink – and will grow brilliantly in soil, raised beds or pots throughout autumn, winter and into spring. The baby leaves can be used in salads, the big leaves and stems can be made into fabulous gratins, or into fritattas. The stems should be chopped into chunks and cooked first, for 2 – 3 minutes, then the leaves added. One of our all-time favourite recipes for using our Swiss Chard, especially the ‘White Silver’ Chard, is Chard Gratin. It goes fabulously with Sunday Roasts, and is easy to do. Just click on the Recipe name above to read all about this rich, creamy dish. Our radishes, ready to eat. 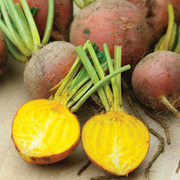 This is a picture of my favourite Radish, ‘French Breakfast’. It grows about as long as my little finger, and is fantastic for pre-meal nibbles, or part of an Antipasti board. Just wash them, top and tail, and place on a platter next to a small dish of tasty salt, such as Maldon. Great to have with a glass of Prosecco or White wine. But also perfect to add to salads – the colour Radishes bring to a Green Salad just lights up your appetite and is visually stunning. I grow this one every year, along with other types I might fancy. The picture below is of our home-grown Radishes pickled by the ‘pickle’ expert is our household, Erik. These look stunning in the jar, and go brilliantly with Christmas food, or slices of home-cooked gammon or ham. 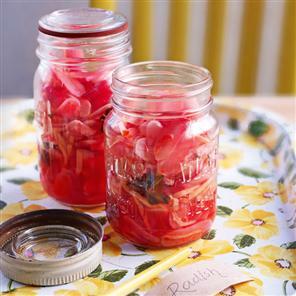 If you fancy having a go at this fun relish, click to have a look at Erik’s recipe for Pickled Radishes. 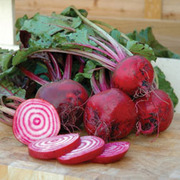 Beetroot seeds are being sown every few weeks from now on. Favourites are ‘Chiogga’, with the pink and white ringed slices. And this year I am growing some ‘Burpees Golden’, which should end up with a fabulous golden hue. 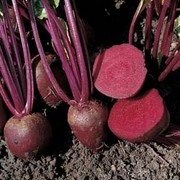 Also, last but not least, ‘Pablo’, the darkest red Beetroot I have seen. So it will be a colourful site in my Kitchen Garden raised beds before too long. Heaven knows what our friendly blackbirds and robins will think of it all? But there is so much to sow. I, myself, use Thompson & Morgan – their range of seeds and plants for Kitchen Gardeners has grown huge – the choice is enormous and the advice is very good now. Plus, obviously, their flower and plant choice is vast. To take a look, click here. It’s amusing that we have had our fantastic new extension built, which has turned into a temporary dining/living garden room, made homely and quite smart (well, we think so) by using some of the furniture which came with us from our big old Victorian house – and will have to be vanquished when the plans for our kitchen are finalised. But in the midst of this fantastic room are seed trays and pots with Courgettes bursting at their seams, desperate to be planted outside when the weather permits, Gherkin plants, Swiss Chard and one of my favourite flowers (or grasses) called Frosted Explosion. I literally cam across the Frosted Explosion flower/grass by accident when I bought a tiny plant from a Farmers’s Market some years ago. It just took my breath away as is grew. I put it in a medium planter and it grew to about two foot (60cms) tall. So I was very excited to find I could buy the flower seeds now from Sarah Raven, (click here to go to Sarah Raven), as well as from lots of growers. 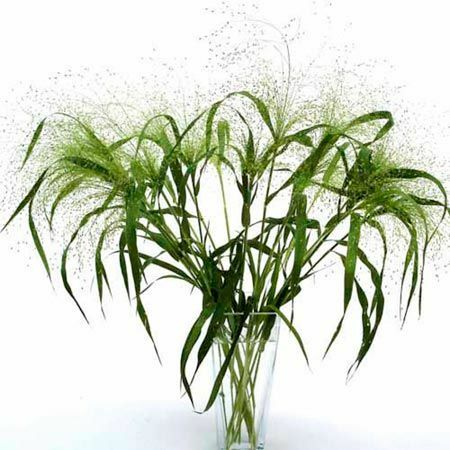 It can also be planted in the flower bed to give almost a mystical look to the coloured plants surrounded by a backdrop of ethereal floating misty grass. This will definitely be gracing my flower beds this year. Frosted Explosion is also great for flower arrangements, adding it’s magic to any cut flowers. Looking out of my window, the skies aren’t that inviting with the grey, dull hue covering Hornsea. When will have some really sunny day to get all these vegetable and flower plants safely in the soil. But if the rains hold off until the afternoon, maybe, just maybe, I’ll be back in my wellies and gardening gloves, talking to the Robins who accompany me as I dig over the soil. Fingers crossed.